The concept is called Socktober and it is both brilliant and kind. Instead of wasting all of our time on the Internet to crush the candy or follow people like Miley Cyrus on the Twitter (again, my old school phone keeps me from doing either), SP and KP would like to get 1 million folks to donate socks to the homeless in the month of October (hence Socktober). I love when the Interwebs can be used for good. I’ve taken part in such small acts before and have been very honored to be part of a couple Love Flash Mobs over at Momastery. It is amazing what people can do when they get together with folks they have never and will never meet to help those both near and far. Naturally, I wanted to get right on board with Socktober. But I didn’t want it be just about me. I wanted my whole family involved. Ben and I believe in giving to various groups and people in as many ways as possible and clearly that is something we want to instill in our kids, too. So why not start young? Me: Hey, buddy. Did you know that not everyone has socks? HD: No, Mama. Everyone has socks. Me: Noooo, there are some people who don’t have enough or even any socks, especially in the winter. What would you say about getting some socks to donate to our local shelter? Me: A place where people can go to get help when they need it. And socks can be help. 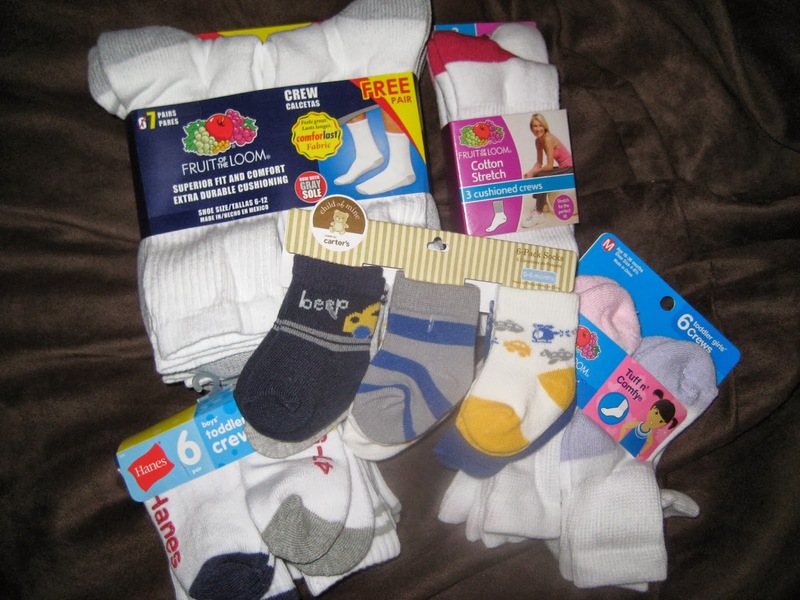 What if we got socks for someone your age to give? HD: Who is 4 who doesn’t have socks? What’s his name? Can you tell me, Mama? This week we’ll take our little bag over to CrossRoads; it’s the local shelter here and it has been far too long since we’ve dropped anything off at their door. I am grateful that we are able to help in even this small way and happy to know that good can come from surfing the web. I hope that you can find a way to make an impact in your own community after reading this. Whether you choose to rock Socktober or something of your own creation, please remember that even the smallest gesture can make a world of difference to someone in need. Next > Medal Ceremony, Anyone?